Joshua Quick spoke to ABC's "Good Morning America" on Sunday and said he grabbed Scott Paul Beierle's gun after it jammed, and hit him. 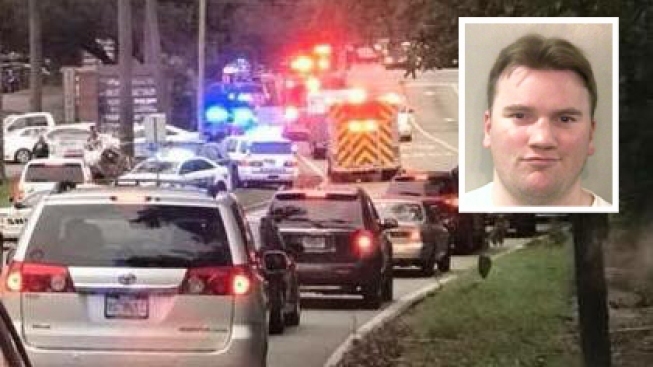 Tallahassee police have identified Beierly as the man who entered the Hot Yoga Tallahassee during a Friday night class and started shooting, killing two and wounding six. Police say the 40-year-old Beierle then turned the gun on himself but have offered no motive in the attack. "Thanks to him I was able to rush out the door," Daniela Garcia Albalat told "Good Morning America." She was in the class and thought she was going to die when the shooting broke out. "He saved my life." Other yoga studios around Florida scheduled classes to help raise money for the victims, and the Florida Yoga Teachers Association set up a GoFundMe campaign. The news was front and center on Yoga Journal's website: "Now, yogis around the world are questioning whether the place they go when events like this happen (read: their yoga studios) are a safe retreat after all." "As an instructor when you start every class, you ask students to close their eyes to relax, because you're in such a safe space," said Amanda Morrison, a 35-year-old yoga instructor in Tallahassee. Beierle was a brooding military veteran and former teacher who appeared to have made videos in which he detailed his hatred of everything from the Affordable Care Act to girls who'd allegedly mistreated him in middle school. The videos were posted four years ago and have been removed from YouTube in the wake of the shooting.